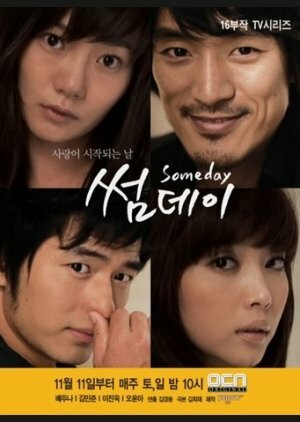 Someday is about four different people's story about love. Hana Yamaguchi was a successful young cartoonist in Japan. Abandoned by her parents and brought up by her grandma, she was cold and aloof and did not believe in love which to her was only a simple biological response. When the elderly neighbourhood street sweeper died, she discovered the affection between him and her neighbour which lasted 60 years. Hana could not understand this kind of love, so she decided to trace her neighbour's footstep to Korea when she disappeared with her lover's ashes. Go Jin Pyo was a doctor who was a comic book fan of Hana. He was overjoyed in meeting Hana and believed that he was in love for the first time in his life. He decided to help Hana in fulfilling her wish to look for her neighbour and enlisted the help of a private eye, Lee Seok Man.Lee was the sole survivor of a car accident whereby his parents and brother were killed. He carried a lot of guilt towards the parents of the other victim and did his best to help out even at the expense of owing money to the loan sharks. 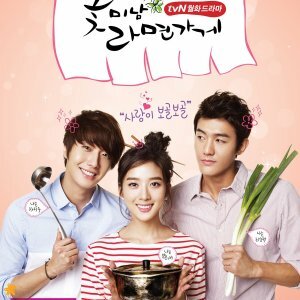 Hye Young was a PD of animation projects and a close friend of Jin Pyo. she didn't realize that she was in love with him till Hana appeared. In bringing her neighbour's love story to fruition and published in print, the process changed the lives and outlook on love for these four people. Oh, this drama. It started out so promising! I remember thinking a couple of episodes in that I actually liked all four leads, and realized how rare that is. Weird girl who doesn't believe in love, charming doctor, competent and independent (yet totally likable) career-woman, and roguish bad boy? What's not to like? 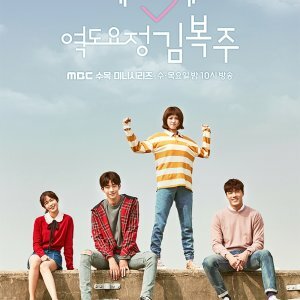 So quiet, quirky Hana goes on a quest to Korea to solve a mystery, and as in so many dramas, ends up with a choice to make in the love department. However, as episodes go by, the writing starts to fall apart. I slowly grew to dislike all four leads. The story dragged, characters started keeping stupid secrets and doing stupid and occasionally outright repulsive things. Luckily, the last episode rebounds a bit and at least ties things up nicely. But really, such a disappointment after a really good start. This was truly a heartwarming story. It was simple yet thouhtful. It told a story about true love and that it exist. It told us a story of two old lovers and how strong their love was while at the same time telling a new story of the start of another true love. Teaching the audience that love is everything you do while in love and love is what you make of it, and that it can't really be defined unless you've felt it and you will know when you feel it. The actors portrayed the story very nicely and realistic. The first 10 -11 eps was really good but towards the end it got kind of overly dramatic but still the ending was good and I'm glad I watched it and when I feel like I've fallen in love with someone I'll watch it again.